Cushion cut diamonds are the chic descendant of the historic old mine cut. A square shape with rounded corners, these pillow-shaped diamonds are a total dream. The cushion brilliant cut features 58 facets that reflect and refract light, carrying its antique romantic charm into the 21st century. Originally, cushion cut diamonds were designed to catch the beauty of candlelight in the 18th century (A.K.A. when every dinner was a candlelit dinner). Looking for a fancy colored diamond? Look no further than the cushion cut! Cushion cut fancy colored diamonds are especially vivid. Who Rocks Cushion Cut Engagement Rings? Almost every engagement ring featured a sparkling cushion cut diamond until the early 1900s. In the millenia that followed, cushion cut diamonds went through a gorgeous renaissance. 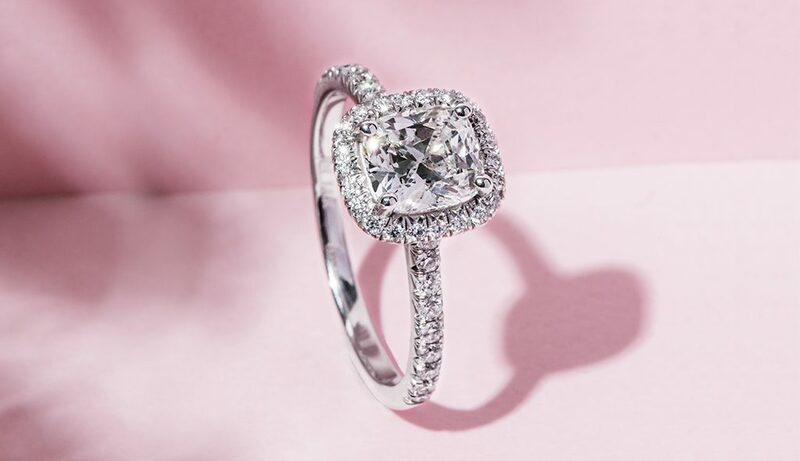 Among those who have chosen cushion cut allure for their engagement rings? Celeb powerhouses including Sofia Vergara, Kelly Rowland, Jessica Biel, Kim Kardashian, and Bar Refaeli. Make sure the corners and sides of the diamond are symmetrical to achieve ideal sparkle! For surefire harmony, choose a True Hearts cushion cut from our premier collection of perfectly symmetrical diamonds. Standard or Modified Cushion Cut Diamonds? Modified cushion cuts have an extra row of facets on their pavilion, which gives them a kind of “crushed ice” look. To the untrained eye, standard and modified cushion cut diamonds look mostly identical. Ready to cushion the glow? Create your Cushion Cut Diamond Engagement Ring. If you’re obsessed with one (or more!) of these rings, let us know in the comments below, or on our social channels: Instagram, Facebook, Snapchat, or Twitter. Learn more in our diamond shapes blog series!